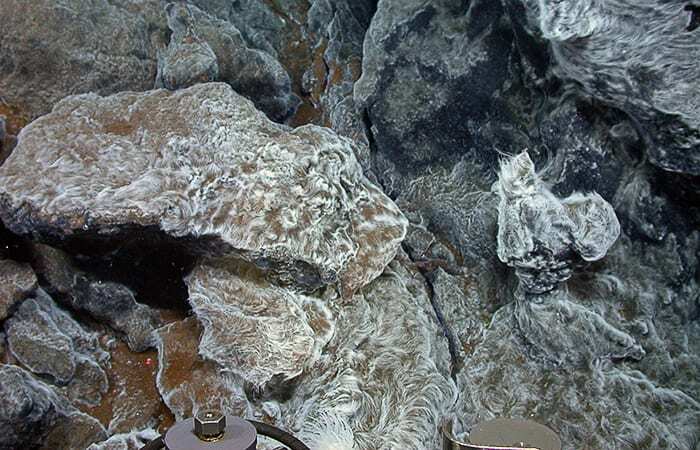 The expedition, led by Woods Hole Oceanographic Institution geochemist Chris German, explored hydrothermal vents on the seafloor in the Caribbean, which spew out super-heated chemical-rich fluids that provide oases for life forms in the dark, cold depths. The researchers returned with specimens and a new appreciation for the ability of life forms to adapt to some of the harshest conditions on Earth. 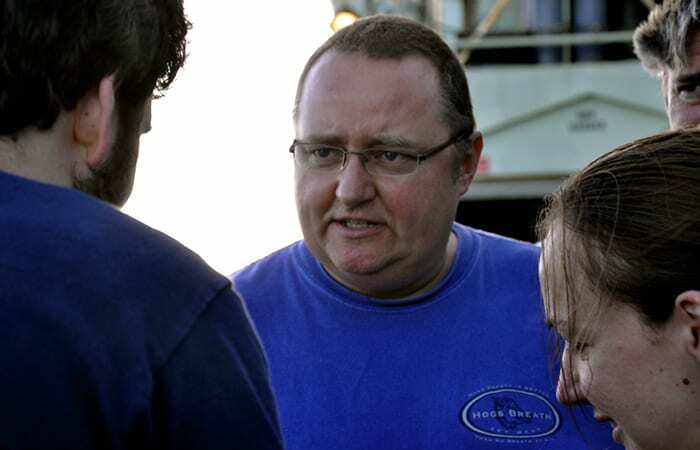 The researchers first found evidence of the vents on a cruise in 2009. They returned to the area this year aboard the research vessel Atlantis with the remotely operated vehicle Jason and specialized sampling equipment to study the chemistry, geology, and biology of the vents at the Mid-Cayman Rise. The cruise, funded by the National Science Foundation, also hosted a blog featured on the WHOI website. The Mid-Cayman Rise is part of Earth’s mid-ocean ridge mountain chain, where volcanic eruptions create new oceanic crust that pushes tectonic plates apart. But here, seafloor spreading can also happen without eruptions: As tectonic forces pull neighboring plates apart, rocks deep within Earth’s crust and mantle can slide upward, becoming exposed at the existing seafloor. “The two plates are simply spreading apart along faults that permit one plate to slide out from under the other,” said German. Scientists theorize that along some slow-spreading ridges, this kind of process creates unusually thin seafloor. That allows water to percolate down to rocks heated by volcanism below. The water picks up chemical from the rocks and re-circulate and vent at the seafloor. The extreme depths and different mineral composition of the seafloor along the Mid- Cayman Rise have produced many different kinds of vents within a relatively short span of seafloor. Researchers on this cruise concentrated their efforts at two sites, one of which, the Piccard vent field, is the deepest known hydrothermal site, at nearly 5,000 meters (3.1 miles) deep. The fluids gushing from some of the vents at this site were found to be just above 400°C (750°F), among the hottest vents known. “In a nutshell, the Mid-Cayman Rise displays perhaps the broadest range of mid-ocean ridge geologic processes all active in the same place,” said German. “It makes a perfect natural laboratory in which to study all kinds of aspects of hydrothermal flow. After Jason pilots mapped the vents with multibeam sonar, WHOI researchers used two devices especially made to collect samples from hydrothermal fields. WHOI geochemist and engineer Chip Breier deployed the SUPR (SUspended Particulate Rosette) sampler that he designed to gather dissolved and particulate samples from warm water plumes rising from vents. Those samples will enable Breier and his colleagues to analyze the chemical, microbial, and mineral composition of the plumes, yielding insights into the vents’ impacts on the ocean. Another team led by WHOI geochemist Jeff Seewald used isobaric gas-tight samplers he developed with others at WHOI to collect high-temperature vent fluids and maintain them at the high pressure of the deep sea until they can be carefully removed and analyzed in the lab. That prevents compounds such as methane and hydrogen sulfide, which are liquid at high pressure, from becoming gases and escaping as the sample is brought to the surface. MIT/WHOI Joint Program graduate student Jill McDermott is studying what these compounds reveal about the nature of this very high pressure hydrothermal site. The chemists and geologists won’t have detailed results until they finish analyzing their samples, but the biologists who were on the cruise already know they found something special. Among the animals plucked by Jason’s manipulator arm and vacuumed up by its “slurp gun” were snails, anemones, starfish, crabs, fish, shrimp, and tubeworms. 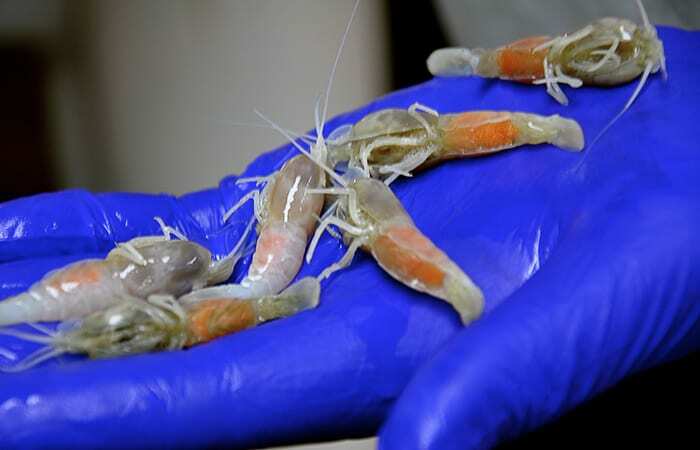 Researchers were surprised to find three shrimp species, rather than just one as seen at other vent sites. Two of the shrimp species had never been observed elsewhere, and many of the female shrimp were heavy with eggs, offering a clue to the timing of reproduction at these deep sites. 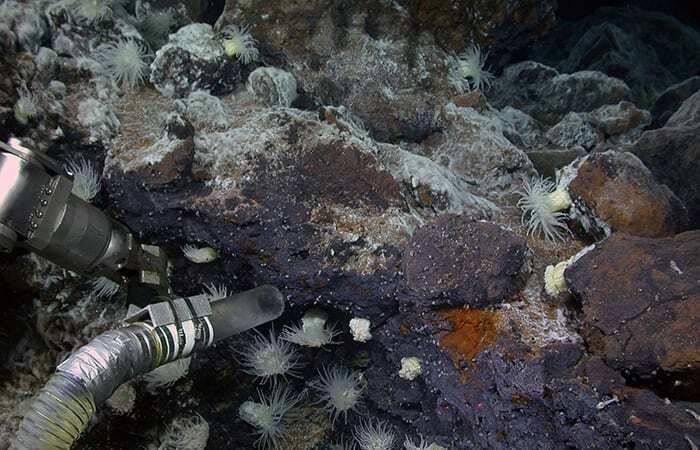 The noteworthy presence of both shrimp and tubeworms at the same vent site confirmed observations German made during a 2011 NOAA Ocean Exploration cruise. Before the discovery of these vents on the Mid-Cayman Rise, no hydrothermal vents were known to host both tubeworms and shrimp. Tubeworms have been found at hydrothermal vents in the Pacific Ocean and at cold seeps in the Atlantic, whereas shrimp dominate hydrothermal vent sites on the Mid-Atlantic Ridge. How both kinds of animals arrived and came to thrive at the Mid-Cayman Rise are intriguing questions for further investigation. The biologists also took samples of microbes at the sites, including of the thick, wavy microbial “fur” on rocks surrounding the vents. In a place without light and therefore without plants, chemosynthetic microbes are the base of the whole ecosystem. They gather and store energy from chemicals in the vent fluids, using it to power the production of organic matter—their own cells—that larger organisms eat. Additional samples of rocks, water, and organisms were collected by scientists from NASA’s Jet Propulsion Laboratory. Those researchers are studying the ecosystems at vents because of the space agency’s interest in developing probes to look for life on other planets and their moons. 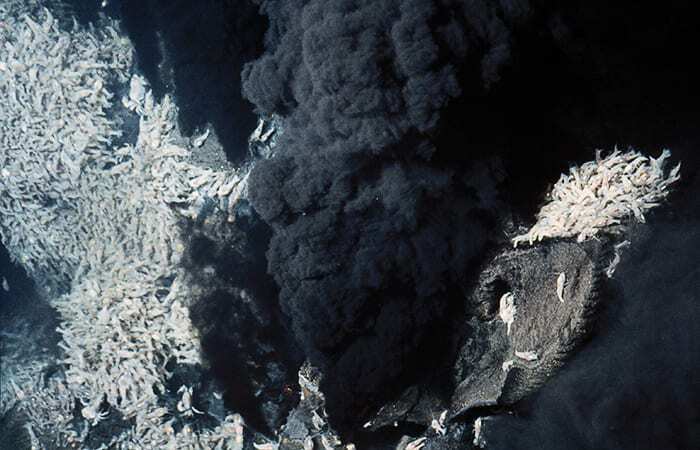 Scientists think life on Earth may have originated in the mineral- and organic-rich fluids at hydrothermal vents, and that such habitats may exist elsewhere in the solar system and beyond. Discovering how life adapts to hydrothermal conditions on Earth and refining our techniques for investigating them could help scientists search for and recognize similar environments on other planets. This research was funded by the National Science Foundation, NASA’s Astrobiology Science & Technology for Exploring Planets program, the Gordon and Betty Moore Foundation, InterRidge, and the Natural Environment Research Council (United Kingdom).